James Mauro. Twilight at the World of Tomorrow: Genius, Madness, Murder, and the 1939 World’s Fair on the Brink of War. New York: Ballantine Books, 2010. Photographs, bibliographical references and index. Pp. 401. ISBN: 9780345512147. $28.00. New York’s 1939-1940 World’s Fair has long staked its claim on American popular memory, and seven decades on, it remains a fixation. A bustling traffic of fair souvenirs and memorabilia are bought and sold on eBay.com and at other places online. Many scholars, especially art and architectural historians, continue to scrutinize its central design innovations and its most progressive, visionary aspects. And ask any New Yorker or Long Islander over “a certain age” to share their favorite fair memories, and you are likely be carried away with them on a bubbling wave of nostalgia: from unforgettable rides like Futurama to the great enormous white Trylon and Perisphere, the official symbols which loomed majestically over the Fair’s Flushing Meadows landscape. Naturally, few care to remember that the New York World’s Fair – its politics, its location, and its chosen themes – elicited controversy from its inception. Nor do people tend to recall that when it ended in October of 1940, the fair was spectacularly in the red, with $19 million less in revenue than had been anticipated and only about half the visitation organizers had foreseen, with a still remarkable 45 million through the gate in two years. Also forgotten in most discussions about the “World of Tomorrow” is the tremendous back story of its making and its day-to-day trials and tribulations, involving a star-studded cast of supporting players that included Mayor Fiorello LaGuardia and Robert Moses. 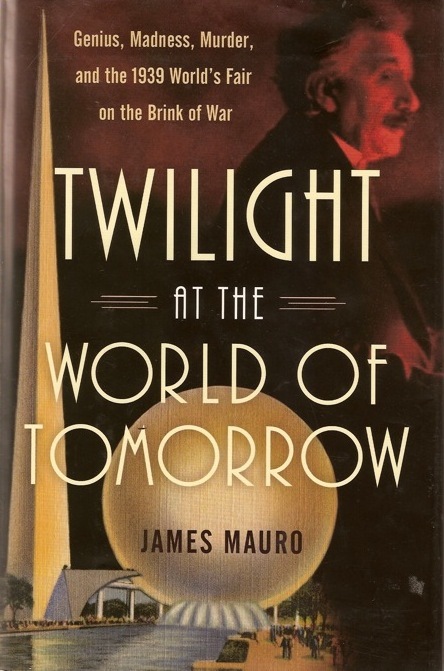 Writer James Mauro has returned readers to this lost terrain in Twilight at the World of Tomorrow, and he’s done it by assembling an entertaining and satisfyingly detailed narrative of “one of the most extraordinary events to take place in the twentieth century.” Mauro points out that the fact that this grand affair would emerge out of the ash and garbage heap which had been accumulating in Flushing for decades and was memorably portrayed by F. Scott Fitzgerald in The Great Gatsby was just the first of the fair’s many ironic moments. “It is just like New York to invite the world to a big party, and then set up the tables next to the finest garbage dump in town,” sniffed The New Yorker. But Mauro explains how the fair was destined to rise like the proverbial phoenix even if it never fully achieved all of its ambitious aims. Most prominent – and colorful – in his telling of the story is Grover Whalen, the former city police commissioner and Wanamaker’s Department Store manager and the master of publicity who took charge of the World’s Fair Corporation in 1936. Whalen’s reputation as a gardenia-wearing gadfly who had emceed many other important social events in the city’s recent history, virtually guaranteed the fair would get great press. Despite the undercurrents of war on Europe’s horizon, he courted and entertained world leaders and corporate VIPs to gain their participation, including making a special recruitment visit to Benito Mussolini. Whalen found many ways, great and small, to capture the imagination of both world leaders and the general public: from getting the governor to agree to stamping “New York World’s Fair” on every license plate in New York State to pushing all three New York City baseball teams—the Giants, Yankees, and Dodgers—to emblazon the Trylon and Perisphere on their uniforms. While Whalen sold the fair, Robert Moses cleared the land for it after an acquisition by typically aggressive means, including condemning nearby homes and structures and forcibly evacuating residents and squatters. After steam shovels and trucks moved away ashy debris, Moses work crews dredged Flushing Creek and created 17 miles of roads, 15 miles of gas mains, 10 bridges, and 2 artificial lakes. The fair opened its turnstiles on April 30, 1939, and despite thoroughly enchanting almost all who experienced it (outside of its high-minded critics), a number of forces conspired to limit its success. The entrance fee (75 cents) and food concessions were criticized as too expensive for the Depression and hopes that great throngs of middle America would come to New York to see the fair never materialized: 85% of visitors had traveled less than 500 miles to see it. Most of all, the fair was a victim of its own timing, the peaceful harmonious global image it projected clashing badly against the start of World War II near the end of its first season. As Mauro ultimately reveals, the bad news outside the fairgrounds had a way of seeping into this utopian landscape, no more tragically than in the bombing at the British Pavilion on July 4, 1940, which took the lives of two New York City police detectives. For the most part, Mauro skillfully weaves together at least four separate storylines in his drive to create an evocative, gripping account. It is not surprising to read in his acknowledgements section that this book initially began its life as a novel, as character development and interesting anecdotes play an important role in propelling his narrative along. Comic and tragic in its details, Twilight at the World of Tomorrow has plenty of depth and is based on solid research, including use of the enormous fair archive at the New York Public Library. Still, its largest aspiration is to keep the reader turning the page. In at least one respect, Mauro may have tried to do too much in pursuit of this goal: the ongoing discussion of Albert Einstein’s involvement in both the fair’s events and advocacy of America’s budding atomic weapons program struck this reader as both a little beside the point and a story already well told in other places. Like the fair itself, you may find this a tent worth stepping into or a bit of a distracting sideshow to an otherwise enjoyable experience.